Otto Friedrich Müller (1730 - 1784). The example of the brown garden snail (Cornu aspersum) finely demonstrates, how the scientific name of a snail species has developed over the centuries, what the procedures are in providing scientific names (or what they are not), and that sometimes there are special cases. 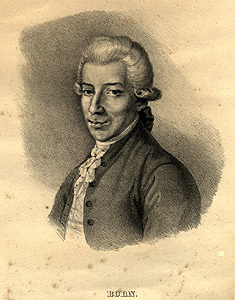 The story begins with the Danish naturalist Otto Friedrich Müller (1730-1784). 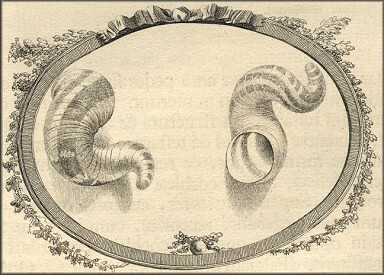 In 1774, he published his book "Vermium Terrestrium et Fluviatilium seu animalium infusorium, helminthicorum, et testaceorum non marinorum succincta historia", first mentioning Helix aspersa, literally the spotted snail, because at that time, at least all round snails were called Helix. 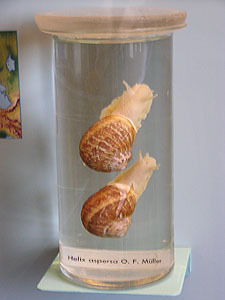 Müller's book was also special in another regard: He not only wrote important basic information on snails, but also on micro-organisms, the so-called infusoria, as they were called at the time. In 1778, Ignaz von Born (1742-1791) wrote another book in Vienna. He had to publish a description of the imperial natural collections in what is today the Vienna Natural History Museum. In the book, "Index rerum naturalium Musei Caesarei Vindobonensis" he published a snail he named Cornu copiae (the horn of plenty). This snail shell clearly was misshaped, what we would today call a scalariform shell. 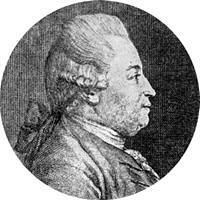 Ignaz von Born was quite an interesting person himself: He was a acquaintance of Wolfgang Amadeus Mozart. Like the composer, he was a freemason (probably the archetype of the wise Sarastro from the Magic Flute). He became quite well known because of his publications on mineralogical subjects and inventions. A further systematic name was given to this snail species when finally Jean de Charpentier described it another time in "Catalogue des mollusques terrestres et fluviatiles de la Suisse", pubished in 1837. In that works, the species' name was to be Cryptomphalus aspersus. Cryptomphalus in Greek means "hidden navel", as the shell navel or umbilicus is hidden beneath the columellar part of the apertural lip (picture on the left). Looking at the brown garden snail's systematics from a modern point of view, it becomes apparent that there are obviously two competing opinions how the species should be named correctly. First there is the Check List of European Continental Mollusca (CLECOM, in the edition of 2001), where the species is mentioned as Cornu aspersum aspersum (O.F. Müller, 1774) under the genus Cornu Born 1778. The explanation states: "(Cornu): Cryptomphalus Charpentier 1837 is a younger synonym of Cornu Born 1778. The name has been in frequent use for the last years, though it was based on a teratological specimen, so a suppression in favour of Cryptomphalus is hardly possible (Pilsbry 1948: 1091, Zilch 1962: 21 Anm. 58, Waldén 1976: 25) [vP, F]." An opinion opposed to this was published in 1996 by Giusti et al. 1996 in their book "The non-marine molluscs of the Maltese Islands". Based on anatomical characters common to both species, the brown garden snail and the singing snail Cantareus apertus (Born 1778) were placed in one and the same genus Cantareus Risso 1826. Especially mentioned, Cornu as a genus name was not supposed to be used, as the specimen used for von Borns description was a misshaped, a teratological one. And the International Commission on Zoological Nomenclature (ICZN) specifically states that teratological or misshaped specimens may not be used as the basis of a species description. In a review of this book, however, J. Gerber writes in the 2000 edition of Heldia 3/1 (pp 42 ff. ): "If "Helix " aspersa must be placed in one genus with "Helix" aperta on the grounds of genital characters, needs further examination. Using the genus name Cantareus Risso 1826, however, appears to be a problematic solution. It cannot be proved that the name Cornu copiae was chosen by von Born with the intention and the knowledge of naming a teratological specimen. Therefore, ICZN (see above) is not concerned and as a consequence, Cornu is an available genus name". As a summary, Giusti's arrangement of Cornu and Cantareus in one common genus Cantareus is not accepted by a larger number of malacologists. Besides, the genus Cornu Born 1778 is understood as available, because von Born neither had the intention nor the knowledge to specifically describe a misshaped specimen, but instead he was describing the snail species as such. The result is that some malacologists stay with the name Cantareus aspersus according to Giusti and others stay with Cornu aspersum according to CLECOM. The present homepage will stay with CLECOM, as already had been mentioned in the introduction. One thing, finally, remains for sure: Cornu aspersum or Cantareus aspersus, whichever of both name is used, the brown garden snail's correct name definitely is not Helix aspersa. Bank, R.A., Falkner, G., Proschwitz, T. v. (2001): CLECOM Project - Checklist of the non-marine Molluscan Species-group taxa of the States of Northern, Atlantic and Central Europe (CLECOM I): Heldia 4 (1/2) (2001). Born, I.A. (1778): Index rerum naturalium Musei Caesarei Vindobonensis. Charpentier, J. (1837): Catalogue des mollusques terrestres et fluviatiles de la Suisse. Gerber, J. (2000): Besprechung von Giusti et al. (1996), The non-marine molluscs of the Maltese Islands: Heldia 3 (1). Giusti, F., Manganelli, G., Schembri, P. (1996): The non-marine molluscs of the Maltese Islands. Müller, O.F. (1774): Vermium Terrestrium et Fluviatilium seu animalium infusorium, helminthicorum, et testaceorum non marinorum succincta historia. Cornu aspersum (Müller, 1774) Brown Garden Snail (Jacksonville Shell Club).